Our guide to the best graphics cards for every use and all budgets. Searching for the best graphics card? We can help. Whether you prefer the grunt power of Nvidia or the driver stability of AMD, in this list we’ve selected the very best graphics cards right now – for all budgets. Graphics cards (or GPUs) serve two roles in modern computers. In games, they accelerate 3D visuals with all their under-the-hood hardware power used to determine the frame rate and resolution for those visual effects, whizz-bang explosions and pyrotechnics we’ve come to expect in modern games. For digital creatives, including graphic artists, designers, illustrators and 3D professionals, the same hardware can be harnessed in tools such Adobe Creative Suite (both Premiere and Photoshop), Blender, Maya and 3DS Max, along with plenty of other software, to dramatically boost rendering times, at least in specific parts of the software, such as when applying certain plug-ins, filters and effects. A powerful graphics card can make a huge difference with some tools, and some effects can not even run on a CPU alone. Nvidia and AMD make two kinds of graphics cards that are roughly aimed at either gaming or design use. For Nvidia, you probably already know the GeForce gaming brand, while it’s the Quadro cards that are for professionals, and with AMD it’s Radeons for gaming and Radeon Pro for creative software. The catch is that the professional-grade cards cost a lot more. For the higher pricing of Quadros and Radeon Pros, you get basically the same hardware specification found in much cheaper gaming cards. They’re the same underlying design, the same architecture, and similar specifications, but with a few crucial differences. Quadro and Radeon cards have certified drivers. That means they have been tested for compatibility with specific software, offer better performance with design software (in certain circumstances) and are (allegedly) less likely to run into issues. They have ECC memory for extra precision. And sometimes they run at lower clock speeds, meaning they have lower power requirements and less thermal demands. These aren’t niche features. If your livelihood depends on your design work, you don’t care about gaming, and want absolute reliability, it’s the Radeon Pro and Quadro cards you should be looking at. Another difference you’ll find is how the two classes of graphics cards are manufactured. With gaming cards, Nvidia and AMD produce and sell reference designs, but a long list of other manufacturers, including Asus, MSI, Zotac, EVGA and Sapphire, sell variations on the reference specification – with different cooling systems and faster clock speeds, but generally always the same core design. For Quadro cards, Nvidia works with a single manufacturer – PNY – to produce all its hardware. Look at any graphics card review and it will be full of three-letter acronyms that are used to illustrate the kind of software performance you can expect. But it can leave you wondering which of these figures matter in a modern graphics card. The key specifications often quoted in reviews and by manufacturers are memory (capacity, bandwidth and speed) the number of cores (basically the guts of the hardware) and the card’s clock speed (in MHz). These specifications vary between GPU generations and across the various tiers, and the cores in Nvidia and AMD cards aren’t the same. Nvidia uses the term Cuda cores while AMD refer to its GCN cores. Performance between AMD and Nvidia absolutely can’t be compared by suggesting an AMD card has more or fewer cores than an Nvidia card. Got all that? Now for our pick of the best graphics cards available now. Nvidia’s flagship RTX 2080 is the first 2000-series Turing architecture card on the market, and the first to bear the name RTX rather than GTX, which reflects the new technology it supports for real-time ray tracing. This feature is supported in a select number of newer games – and looks awesome – but it’s not in widespread use yet. It's the overall leap forward in the hardware specification over previous generations of GeForce that makes the RTX 2080 the top choice. It’s this leap that make the RTX 2080 our top choice. With this generation, Nvidia has increased the number of Cuda cores from the GTX 1080, in addition to introducing new, dedicated hardware RT cores for ray tracing and Tensor cores for 3D arithmetic. The RTX 2080 also uses new higher bandwidth GDDR6 memory, although it remains at 8GB, as on the GTX 1080. In games, you can expect approximately 50 per cent better performance than the previous generation’s top-end card, the GTX 1080 Ti. And in design software, the improved application performance means better Cuda and OpenGL acceleration as well – outperforming many of the current Quadro models in some tests, with the addition of support for Cuda 7.5. However, explosive internet arguments followed Nvidia’s pricing announcement, with the RTX 2080 priced higher at launch than the GTX 1080 was, as it’s certainly tough on the wallet. However, buying an RTX 2080 now is a great investment – as it is unlikely to be beaten in performance for some time. The GTX 1070 is now a brilliant recommendation for mid-range gaming PCs, thanks to the arrival of the 20-series cards making it slightly more affordable. While cheaper cards just as the GTX 1050 and GTX 1060 can still do 1080p gaming just fine for those on a budget, the 1070 has much better future proofing and can even go up to 4K in some modern games, since it has 1,920 Cuda cores to the GTX 1060’s 1,280 and the GTX 1050’s 768. Better looking games in a few years will struggle on those cards, while the GTX 1070 will continue to power through. If your PC budget is realistic, but not too constrained, the GTX 1070 is absolutely the best recommendation for a card that you can be sure will always get the job done. The fastest graphics card on the planet. Every generation, Nvidia releases its flagship model, then a second, steroid-enhanced version of it, with high pricing that is really only something the most enthusiastic PC users will consider. The RTX 2080 Ti is now the absolute fastest graphics card on the planet – 4,352 Cuda cores, almost double the ray tracing hardware of the vanilla RTX 2080 and almost double the graphics processing power. This card alone costs more than the average mid-range PC though, but with some serious hardware behind it, the investment could be well worth considering, including for designers whose workstation doubles up as a gaming PC – as Cuda and OpenCL performance has leapt forward along with gaming performance. AMD has just slipped out a nifty new professional-grade graphics card, the WX8200, to steal some of Nvidia’s thunder, bringing the performance of its higher tier WX9100 card to a tasty price point (relative, of course, to the generally much higher pricing of Radeon Pro and Quadro cards). It’s still based on the current Vega architecture, but has 3,584 cores, with 8GB of ultra-fast HBM2 memory to deliver some great performance in specific tests. Depending on the tools you use, AMD cards may offer better performance. 3D animators who rely exclusively on Maya or Blender, for example, may benefit from choosing AMD over Nvidia, although we’d recommend some further research, and considering your workflow before investing. OpenCL applications work great with AMD graphics cards and the WX8200 is absolutely the best choice for an AMD professional-grade card around right now. With the GeForce RTX 2080 now on the market, the standards for performance will slowly shift over the next few years, with better-looking, more demanding games putting today’s budget and mid-range cards under more stress. But right now, the GeForce GTX 1060 is a brilliant buy. At 1080p resolution, it achieves a fluid 60fps in (most of ) today’s games, which is testament to the serious power of the 1000-series generation. And it’s highly affordable too. Be warned though, that in tomorrow’s games, it’s certain to struggle a bit. And, along with the GTX 1070, there are number of extra small designs of the GTX 1060 as well, with all the same performance but squeezed down to fit into tiny PC cases, which is great if you like the idea of a mini workstation of gaming PC. Confusingly there are also two versions of the GTX 1060: one with 3GB of video memory and one with 6GB. Absolutely go for the 6GB version if you can afford the small price increase, it has more Cuda cores as well as the extra memory and further down the line, that extra hardware will come in useful. Choosing the AMD option in gaming graphics cards often is about getting better value for your money, which explains why the the AMD Radeon RX 570 is one of the best cards for gamers on a tight budget. It comfortably wins the battle for performance over Nvidia’s Geforce GTX 1050, almost matching the GTX 1060 for a considerably lower price. With only 4GB of memory, it might struggle at resolutions beyond 1080p, but this tier of cards is about solid frame rates at HD resolution anyway, rather than 4K. The pricing tiers for Nvidia’s Quadro cards follows a similar pattern to GeForce line, with the exception that you’re pay a whole lot more at each tier. The two high-end cards, the P5000 and P6000, are real monsters for 3D design but are priced around £2000 and £4000 respectively, which is beyond the reach of most mere mortals. However, the P4000, which sits in the middle of the lineup, is within the realm of affordability, and can output some cracking benchmark results in Cuda-based applications and 3D design software. That balance of price and performance makes it our favourite Quadro card. But, as of writing the successor to the P4000 is about to fly out of Nvidia’s factories and onto the market, replacing all current Quadro cards and based on the same Turing architecture as the RTX 2080. 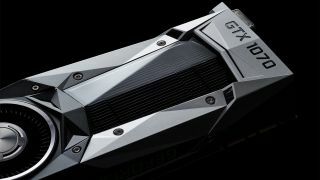 If you’ve decided you want an Nvidia-based professional graphics card, then you should certainly wait just a bit longer. The RTX 2070 is the last and most affordable of Nvidia’s new lineup, although given that the entire range may be on the pricey side, the approximate £500 asking price is still a considerable investment for any gaming PC. But you do get a lot for your money, the RTX 2070 is brilliant for 4K gaming, with only a select few of the most demanding games requiring the detail settings turned down to achieve the 60fps sweet spot. It packs in ray-tracing hardware like the GTX 2080, and will still deliver a great, high-end gaming experience. Last generation’s top-end card is still on the market, and the Nvidia Geforce GTX 1080 Ti still packs a mean punch in games. And prices have dropped since the RTX 2080 was released. That might make it a better value purchase, given that it comes close to the RTX 2080 in performance. You could save a few bob, but be aware won’t get the most up-to-date specs or features such as hardware support for ray tracing, which is only in a light handful of games now. In time, you might miss these features by not choosing the latest generation of GeForce cards now, but if your budget is restricted, going down this route will certainly mean superb gaming and rendering performance for now, including at 4K resolution. The Quadro P2000 (and the pricing tier it occupies) is hugely popular for general-purpose workstation and mid-range design PCs. It’s a Quadro but it’s actually affordable, and can be squeezed into the sort of PC budget that we’d consider realistic. It may not look like much, as the card is very small compared with some of the behemoth gaming cards on the market, but it requires no external power source and is also found in design laptops too. Again, the Quadro line is about to be refreshed, but it should be expected that the new Turing-based cards will have a similar mid-range tier that should be relatively affordable in the same way the P2000 is. However, there are some basic things to be considered when shopping around. A higher resolution you are working at (or gaming) needs more memory. If you intend to work with 4K resolution either on your screen or with larger textures, you need a graphics card with more memory. 8GB or more is now common on the higher tier cards. Don’t forget to also consider the display(s) you work with, and the outputs of the graphics card you buy. All modern graphics cards use digital video outputs only, either HDMI or DisplayPort (which may be either a small square-ish miniDP connector or a big D-shaped connector). For 4K or 5K displays, all graphics cards now support at least the DisplayPort 1.4 and HDMI 2.0 standards that offer the bandwidth needed for 60hZ refresh rates – which was a serious problem on older graphics cards when higher resolution displays first became a mainstream proposition a few years ago. When 8K displays finally become more realistically affordable, this same problem will rear its head again. Lastly, the single biggest differentiator of performance in graphics cards, which may be obvious to some readers, is the hardware generation of the series of cards, always codenamed for reference. Nvidia names its cards after scientists – Pascal, Turing, and so on, while AMD is a little more obscure, with Polaris and the newer Vega architecture sitting on the market currently. Nvidia and AMD roughly produce a new series of graphics card every two years (it varies) and when a new generation comes out, it means raising the bar in all technical areas – more cores, more memory, more bandwidth and more features, often squeezing into the same power and thermal demands of the previous generation of card. For the best possible performance and best future proofing, only ever look at the newest cards. At the time of writing, Nvidia has just unleashed its latest RTX 2000-series generation, with the architecture making its way into the Quadro RTX professional series before the end of 2018.